Just to give reassurance that replacement windscreens can be obtained here are some photos of one going onto my 1990 12v auto earlier today. I had not planned to change the screen but then there was an argument with a windsurfing board! Fortunately the existing was not original and suffering some de-lamination with wiper scoring. I managed not to damage any trim and the replacement looks very smart. Regards, Matthew T.
Last edited by MTXM on Tue May 01, 2018 11:12 am, edited 1 time in total. Unfortunately as for other recent posts I cannot add any photos - is there a problem with the site? Regards, Matthew T.
I have PM'd Ciaran, but no reply yet. Last year I had a new screen fitted in the Cobalt car. No delay in obtaining one. That's excellent news. What about the fine rubber trim at the top of the screen. Did this come off easily Matthew? In my limited experience, the fine rubber trim is quite durable, Russ. I've never heard of issues regarding that. 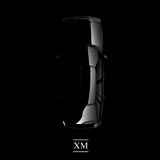 XM Car top trims are narrow and easily recovered. A universal Transit profile kept in the van by most screen fitters is an ideal replacement if needed. XM Estate top trims are a totally different ball game. The top trim is wide, metal reinforced, hooked on a continuous metal strip and rolls up like a spiral as you ease it away. With all of this it is usually replacing the second screen onwards that the trouble comes. The factory screens are very accurately glued with no overspill. Trim clips are perfect and complete. Second fit on the glue can often go way under the trim as well as fixing the glass. Some fitters even glue the trim down because it is difficult to refix. I now only use fitters that let me watch and talk me through what they are going to do. Glass availability can be a problem. Most that is now obtained is searched out old stock which will not be reordered. According to my Fitter there were only about five XM screens currently in the UK with his Supplier, which is the largest in the business and linked to Autoglass - get them while you can! It is necessary to exercise care with the top trim Russ but in this case fortunately it came off unscathed! With regards, Matthew T.
At 5 screens currently available int he UK and 280 cars, that's a pretty good ratio. I can't see demand being more than 5 per quarter. Windscreen for auction sale ebay, .99p starting price. This screen sold for £1.04 but it needed a trip to Brighton to collect it.